In the book Radical Son David Horowitz tells his story. Horowitz is now 76 years old. Fifty years ago he was a central figure in the revolutionary student movement in the United States. He was the brilliant son of two deeply committed members of the American Communist Party. During the years of the Great Depression in this country, his parents were convinced that the Soviet Union’s form of government was the hope for the future of our nation. They even visited Russia to learn all they could about communism so they would be prepared to lead the revolution when it came to the United States, as they were sure it would. They hated the American way of life and Joseph Stalin was their hero. A few years later, they were devastated to learn that while they were visiting the Soviet Union, their hero Stalin was killing off tens of millions of his own citizens. But they remained convinced communists, blaming the reign of terror on Stalin alone, and not the communist system. David Horowitz inherited this belief and went to college at Berkeley in California, determined to continue his parent’s work. He supported Castro in the Cuban revolution and the communists in North Vietnam, and he blamed the United States for the Cuban missile crisis. A colleague wrote that President Kennedy was worse than Adolph Hitler, Horowitz was friends with and helped the radical and violent Black Panthers, and he himself was a member of the violent SDS organization of student radicals. The world was a mess, and it was all America’s fault, said Horowitz and his comrades, and the only answer was revolution. They openly despised America, and he describes how he and his friends sought to manipulate the natural mischievousness of American college students to create all kinds of racket and chaos in support of a movement that the students barely understood. Then, over a several year period, David Horowitz changed his mind. His eyes were opened to the evils of communism wherever it was practiced, not just by Stalin; and he grew to an appreciation of this nation and our own political and religious heritage. He is now a proud defender of democracy and a vocal critic of many of his old friends, several of whom became professors in colleges where they continue to proclaim their anti-American message. The political message of the book is interesting; but I tell this story only as background for what I found to be an even more interesting part of the story. 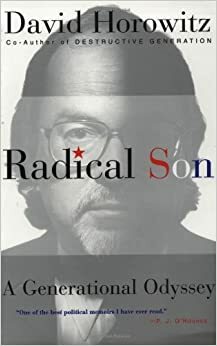 In the book Radical Son, David Horowitz not only describes the events of his life, but he also reflects on his incredible journey. He tries to understand why he believed what he believed and why he did what he did. He seeks to understand how he could at the same time rebel against his parents, and yet become just like them. He matter-of-factly describes how he so often foolishly conformed to the thinking of the group, even when he knew it was wrong. He tells of how he chose to remain blind the evils of communism; and, how he chose not to see the strength of the American system, the system that gave him the freedom to work and to speak even as he opposed it. He now wonders why he changed his mind and others did not, and he wonders why he did not change his mind sooner. It is a harshly critical book, and he names many people I remember from the news in my high school and college days, leaders of a movement that was to transform America. He tells of their arrogance, their hypocrisy, their deceit, and most of all, their foolishness. He is as hard on himself as he is on everyone else. The book reads almost like a confession of sins and it is filled with regret. Along with all their foolishness and all their sins, there was in many of these young radicals a sincere belief that they could make the world a better place and there was, in at least some of them, a strong desire to do that. Horowitz himself put a lot of energy into that effort. He was a brilliant and hard working young man, he made many sacrifices to the cause, and he was very influential. But he now sees it all as wasted work in misguided movement that did far more harm than good. This is not to suggest that there were not things that needed changing in the 1960’s. There are changes needed in every age. I am simply summarizing the story he tells of the mistakes he made, or as we might say, the sins he committed. The book raises the question for anyone who reads it: “Why do we do the things that we do?” As I read it, I had to ask myself, “What wrong turns have I made and what has influenced me to do the right things sometimes and the wrong things other times?” Horowitz can’t help but describe the influence his parents had on him, the influence of his group of peers, and the influence of important or strong-minded people that he met. But he is most of all very open and honest about the mistakes he made all on his own, those things he can blame on no one but himself. So how do you think about your own shortcomings and/or successes? How would you describe them to another? One might say, “I know I have a violent temper, but I inherited that from my father.” Another might say, “I know I am a worrier, but I can’t help it. My mother was the same way and I’m sure I got it from her.” And still another says, “I know I am too stubborn for my own good, but what do you expect? I’m German.” You see what is going on there? Sins are admitted, but there is no need to confess them, because it is not their fault that they are too hot-tempered, worry too much, or are unbearably stubborn. That’s the way they were born or the way they were raised, so don‘t expect them to apologize or to change. They can’t help it, so you can’t blame them. Or perhaps, you can’t blame yourself– just in case you are seeing yourself in any of this. Proverbs 14:12 — There is a way which seems right to a man, but its end is the way to death. I John 1:8 — If we claim to be without sin, we deceive ourselves and the truth is not in us.